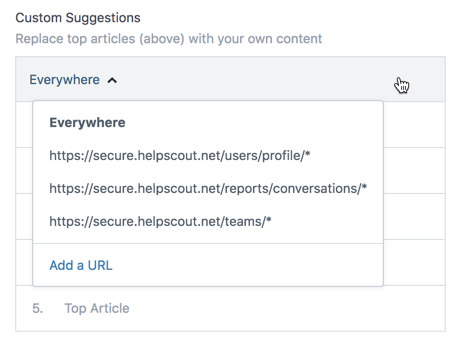 Content Suggestions by URL allow you to suggest relevant articles through Beacon depending on the page the customer is viewing. To add a new URL, click the Everywhere panel, then click the Add a URL link from the menu. In the modal that pops up, enter the URL where you want specific articles to show in Beacon. You can add up to 200 URLs per Beacon. 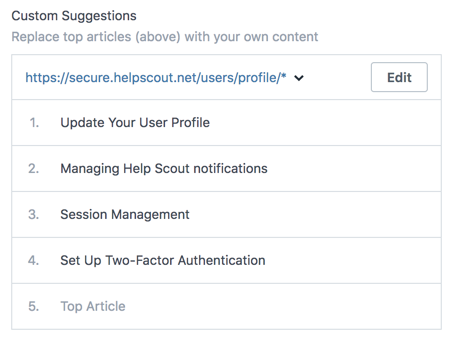 You can go back and edit the articles that appear on a specific URL at any time. Click the URL dropdown menu and hit the Edit button to load in the articles that are displayed on that URL.